The Silver gene mutation that affects some horse breeds produces some striking coat colours, but unfortunately can also result in eye problems. Researchers from the Swedish University of Agricultural Sciences set out to learn more about the refractive state of eyes in Icelandic horses with the mutation. The so-called Silver or Silver Dapple gene primarily influences the black base coat color, usually diluting a black mane and tail to flaxen, and a black body to brown or chocolate. Resulting coat colors are called “silver dapple”, the most common being black silver and bay silver. Black silvers often have sooty white or silver manes and tails with a flat, non-fading, dark grey or grey-brown dappled body coat. Mature bay silvers tend to have reddish bodies, though they can appear chocolate. Manes and tails are usually sooty silver, darker at the roots. The silver dilution is inherited as a dominant trait. Affected breeds include the Rocky Mountain horse, Scandinavian breeds such as the Icelandic horse, the Miniature horse, Nordland pony, Shetland pony, Welsh Mountain pony, Welsh pony, and Swedish Warmbloods. Affected American breeds include the Morgan, American Saddlebred, Missouri Foxtrotter, Tennessee Walking Horse, and the American Quarter Horse. Many breeds do not possess the gene. The unusual coat colours arise from a missense mutation in the premelanosome protein (PMEL) gene. Unfortunately, horses that inherit the mutated gene from each parent are commonly affected by multiple eye problems that can cause sight problems and even blindness. Horses that inherit it from only one parent have less severe clinical signs. It is still unknown if the vision is impaired in horses that inherit the mutation from only one parent. Gabriella Lindgren, Björn Ekesten, Maria Johansson and Kim Jäderkvist Fegraeus set out to investigate if Icelandic horses with the Silver mutation had refractive errors when compared to horses that did not carry a copy of the gene. Their study, the findings of which have been published in the journal BMC Veterinary Research, used 152 Icelandic horses, all of whom were tested for the missense mutation in the PMEL gene. Seventy-one of them were found to have inherited the gene from one of their parents, while five of the horses were homozygous, having inherited the mutation from both parents. The remainder of the horses did not carry the gene at all. Eye examinations were performed on all the horses. The study team found that the five horses which had inherited the mutation from both parents were all myopic (short-sighted) in one or both eyes regardless of age. Up to the age of 16, no differences in the refractive state of the eyes could be observed between horses that had inherited the mutation from one parent and those that did not carry it at all. 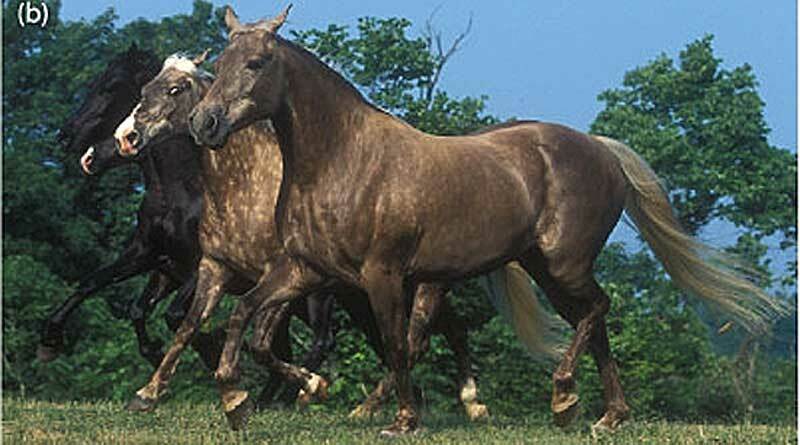 However, over 16, the horses carrying the mutated gene were more short-sighted that those without. The observed shift towards myopia in elderly horses carrying the gene from one parent suggested that the Silver mutation exerted a slow, progressive effect on the optics of the eye, they said. Maria K. Johansson, Kim Jäderkvist Fegraeus, Gabriella Lindgren and Björn Ekesten.